This page is dedicated to helping you safeguard your personal information and to providing you with important banking and other financial updates. Be sure to check back often, as we post any recent information related to fraud and identity theft scams on this page. Our goal is to help you keep your personal and financial information safe and secure. MountainOne does not use unsolicited email, text messages or any social media to discuss your account information. We will never ask for private information using these methods, and you should be cautious of any attempts trying to obtain this private information. Your privacy is important to us. 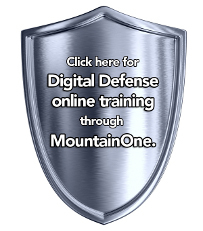 If you are ever in doubt regarding a communication you received, please contact us directly at info@mountainone.com or 855.444.6861. It's National Consumer Protection Week.MountainOne cares about our customers. We encourage you to explore the countless resources available to you through our website, and through the Federal Trade Commission. Protect yourself and be aware of the latest scams affecting consumers. Check out the latest scams on the Federal Trade Commission website. Computers are an essential part of our everyday lives. It’s important to properly configure your home computer before connecting it to the internet to keep it, and your information, secure. Here are some tips from the Department of Homeland Security. Phishing scammers are targeting small businesses by imitating the look of messages your employees routinely receive. We’ve seen an increase in local customers and businesses who have been tricked into thinking they need to wire money. Be careful, and use these precautions. The BEC is a sophisticated scam targeting businesses working with foreign suppliers that regularly perform wire transfer payments. Read this important FBI bulletin to avoid having your businesses targeted by fraudsters. The IRS put out it's 2017 list of top identity theft and other scams around tax time. Learn how to create a cybersecurity plan for your business. Under federal law you are entitled to a copy of your credit report once every 12 months from all three credit reporting agencies - Experian®, Equifax® and TransUnion®. Every consumer should check their credit reports from each of the 3 bureaus annually. Doing so will make sure your credit is up-to-date and accurate. Each reporting agency collects and records information in different ways and may not have the same information about your credit history. Includes information on safeguarding systems and data, and other things to consider in a networked environment. Offers tips to financial institution customers on protecting and maintaining their computer systems, mobile devices, and connections to the Internet. Read this for cybersecurity tips for protecting your business network. Use these precautions to protect your ATM card and yourself while using an ATM. Read this for best practices on protecting your business' customer data. Use these steps outlined by the Federal Trade Commission to protect yourself from Identity Theft. Use this for resources on mitigating corporate account takeover. Learn how to avoid being lured into email scams.